His high delight and optimism when a few of us joined him at his rented house for a celebration that first Sunday night was both clear and infectious. “This is the beginning, only the beginning. Not just me but others from Europe will know they can win now. You watch. What I say is true,” Seve told me that evening. Then he walked me to the trapeze-like contraption he had installed in a doorway and encouraged me to hang upside down, just as he had to do each morning to ease his aching back. Even back then he feared that he faced the probability of a truncated career. 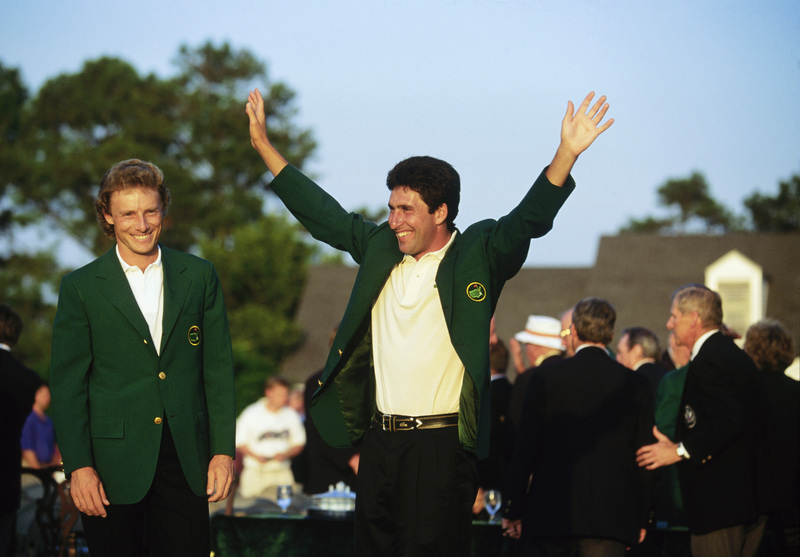 A second victory in ’83 for Ballesteros suggested that Nicklaus’s prophecy of a record-breaking total of Masters before he finished was more nailed-on than fanciful. That it didn’t turn out this way was down to several factors, but most notably that misaligned spine and the shock of chunking a simple enough shot into the water at the 15th hole in 1986 to allow, yes, Nicklaus to step in and win his sixth Masters instead. A fortnight after that error I met Seve in Madrid and asked him, now he had had time to reflect, what had happened on that fairway and on a hole he liked. He looked at me for what seemed a long time and then quietly admitted that he had no idea. “I don’t know, I just don’t know. For me it was just a shot, nothing too difficult, nothing too special. It was not easy, but also not that hard. I have thought about this mistake and I still don’t know the answer.” And I saw what I took to be a flicker of fear in his eyes because he knew that if this error had arrived once out of a clear, blue sky then it could spear him again when he least expected it. He finished tied for second the following year, but there were to be no more victories in Georgia. The great leader, however, had than done his job. Behind him the rest of European golf’s small posse of potentially great players had taken note of his success and raised the bar on their own expectations. Now that Seve had cracked Augusta, Sandy Lyle, Nick Faldo, Bernhard Langer and Ian Woosnam knew they also were entitled to contemplate success there. Meanwhile, a younger Spaniard, Jose-Maria Olazabal, was paying close attention. Before the 20th Century ended, each of these men was to succeed in this quest and world golf was never to be quite the same again. Langer was the first of Ballesteros’ peers to react to the Spaniard’s charge through America’s favourite backyard. The first of Langer’s two wins came in 1985 and in many ways his was the most surprising triumph. The German, after all, had been sporadically suffering from the putting yips for several years. At times, this awful affliction reduced him to tears of frustration. For him to win at Augusta where the greens are acknowledged as the most challenging in the world was as perverse as it was terrific. First, though he had two other obstacles to overcome on that final Sunday in ’85. A committed Christian then as now, Langer and his American wife Vikki headed off to church to pray that Sunday, but for some inexplicable reason their usual church in Augusta was locked and the surprised pair were forced to return home to pray. If that was unsettling, Langer knew that a potentially even more unnerving challenge awaited him at Augusta National when he teed off around two o’clock that afternoon for fate had decreed that he would be partnered by none other that Seve.